Mick Jagger is the infamous lead singer in British rock and roll band The Rolling Stones. He is depicted here bare-chested, playing up to Warhol’s camera. Warhol particularly liked Jagger’s photogenic, ‘bad-boy’ image and this work is part of a portfolio of ten screenprints of the star produced in 1975. He has incorporated blocks of irregularly shaped colour, which, although printed, appear like collaged fragments of coloured paper. In combining this with hand-drawn elements (also printed), the works appear more expressive than his earlier screenprints. The abstract quality of the blocks of colour shows the development of Warhol’s interest in more non-representational art that was emerging in the 1970s. Andy Warhol’s obsession with celebrity Icons takes shape once again in his infamous Mick Jagger series. Warhol’s interest in photography , collage, and drawing created a new conceptual framework associated with the appropriation of Pop Icons.The work relationship between Warhol and Mick Jagger began in 1963 and continued into maturity as both the artist and the musician were at the height of their fame in the early 1970’s. The collaboration, works so well because it manages to capture the essence of both parties involved. By the 1970s Warhol no longer relied on found imagery and had considerably expanded his range of subjects. He often took his own photographs and the ‘hand-made’ look became increasingly evident by additions of collage elements using torn cheap graphic Color Aid papers, which were produced in a seemingly endless array of colors. 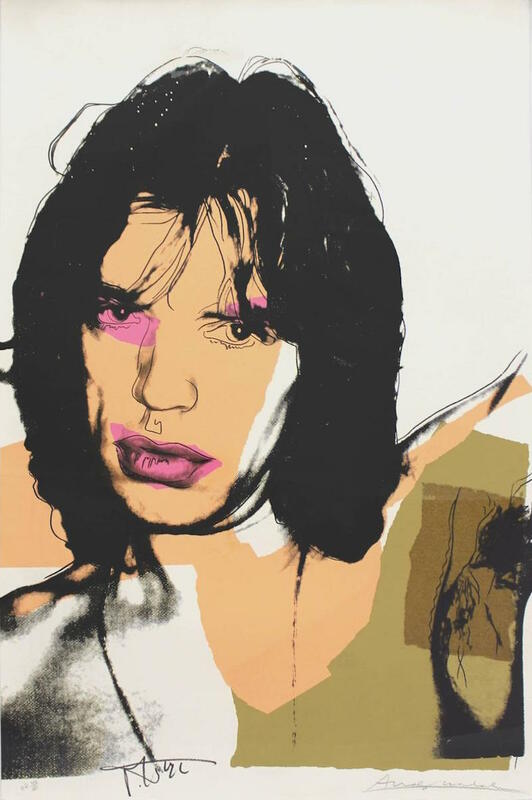 The series of ten screen prints of Mick Jagger were characteristic of this change in style and the artist used a selection of ten of his own photographs that he had taken of Jagger. Warhol had met Jagger in 1963 when the band the Rolling Stones were not well known in the United States. Warhol had designed the band’s provocative album cover Sticky Fingers with its focus on a man’s crotch and a zipper that opened. The album and the design proved to be a huge success and Warhol, ever keen to make money, lamented that he had not been paid enough given the millions of copies that sold. No doubt with an eye for financial success, Warhol turned to the subject of Mick Jagger, now a celebrity friend and part of the New York club scene.